Because today's evangelical world believes that the church is experiencing the Messianic kingdom, we began a study chronicling what the Bible teaches about the kingdom. In this series, the biblical teaching on the kingdom has been surveyed from Genesis to Revelation. We have noted thus far that what the Old Testament predicts concerning an earthly kingdom was offered to Israel during Christ's First Advent. Yet, the nation rejected this kingdom offer leading to the kingdom's postponement. Therefore, what the Scripture predicts concerning the kingdom will not be fulfilled until the kingdom offer is one day re-extended to and accepted by Israel during the Tribulation. In the interim, the kingdom is future as God now pursues an interim program that includes the church. In addition, we began scrutinizing a series of texts that "kingdom now" theologians routinely employ in order to argue that the kingdom is a present, spiritual reality. We began with the use of such alleged "kingdom now" texts in the life of Christ. We noted that the expression "Repent, for the kingdom of heaven is at hand" (Matt. 3:2; 4:17; 10:5-7) merely communicates that the Old Testament expectation of an earthly kingdom had drawn near in the person of Christ. Had the nation enthroned Christ (Deut. 17:15), the anticipated kingdom promises would have become a reality not only for Israel but also for the entire world. As long as Christ was present among first-century Israel offering them the kingdom, it was in an imminent state of nearness. This reality is an entirely different matter from saying that the kingdom was present or had arrived. Is this verse, as "kingdom now" theologians sometimes advocate, teaching a present, spiritual form of the kingdom that Christ's disciples must seek and align their lives with? The answer to this question is provided in the immediately preceding context where Christ's model prayer for the disciples (Matt. 6:9-13) consists of three requests for the kingdom to come and three additional requests for their temporal needs to be met prior to the kingdom's establishment. Thus, contextually, Matthew 6:33 is merely admonishing Christ's disciples to prioritize their lives according to the values of the coming kingdom during their brief sojourn on earth, while they live in Satan's domain, while the kingdom is in a state of abeyance. "Therefore, we are ambassadors for Christ, as though God were making an appeal through us; we beg you on behalf of Christ, be reconciled to God" (italics added). An ambassador is someone who represents the value system of his home country on foreign soil. America's ambassador to Iran, for example, represents American values on Iranian soil. Similarly, God's people represent the values of their true home, the coming kingdom, on Satan's turf, which is the present world system (1 John 5:19). The whole designation "ambassador" makes little sense if the kingdom were a present, spiritual reality. After all, it would be nonsensical to represent the values of the kingdom in the present world as an ambassador if the kingdom was in fact a current reality. "Therefore you are no longer a slave, but a son; and if a son, then an heir through God" (italics added). "Listen, my beloved brethren: did not God choose the poor of this world to be rich in faith and heirs of the kingdom which He promised to those who love Him?" (italics added). 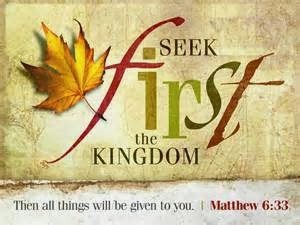 Again, far from teaching a present manifestation of the kingdom, Matthew 6:33 merely teaches that God's people should prioritize their lives according to the values of the coming kingdom during their brief sojourn on earth while living in Satan's domain as the kingdom is in a state of absence and postponement. Only such a view properly handles the designations of "ambassador" and "heir." "The Law and the Prophets were proclaimed until John; since that time the gospel of the kingdom of God has been preached, and everyone is forcing his way into it." "But if I cast out demons by the Spirit of God, then the kingdom of God has come upon you" (see also Luke 11:20). "Kingdom now" theologians interpret this statement to mean that Christ began a spiritual form of the Messianic kingdom at His First Advent. However, this view fails to interact with Christ's "offer of the kingdom" to first-century Israel, which is the idea that the kingdom was offered to the nation by John the Baptist, Christ, and the disciples. Yet, it was rejected by the nation, consequently postponed, and eventually will be re-offered to the nation during the future Tribulation period. This interpretive framework allows the various manifestations of the kingdom in the life of Christ (Matt. 12:28), such as His miracles and exorcisms, to be interpreted as mere tokens of the coming kingdom rather than announcing an inaugurated form of the kingdom. In other words, the presence of the kingdom in the life of Christ could become a reality for Israel and the world had Israel fulfilled her responsibility of enthroning her king (Deut. 17:15). Thus, when understood in the light of this kingdom offer, Christ's statement in Matthew 12:28 was not indicative of the fact the kingdom had arrived. Rather, His statement simply meant that the tokens of the kingdom (His miracles, exorcisms, etc...) could have become a reality for the nation had Israel responded to the contingency of the offer that Christ was extending to her. E.R. Craven, "Excursus on the Basileia," in Revelation of John , J. P. Lange (New York: Scribner, 1874), 95. George Peters, The Theocratic Kingdom (Grand Rapids: Kregel, 1952), 1:600. Craig Blaising, "The Kingdom of God in the New Testament," in Progressive Dispensationalism (Wheaton: Victor, 1993), 248. Stanley Toussaint, "Israel and the Church of a Traditional Dispensationalist," in Three Central Issues in Contemporary Dispensationalism (Grand Rapids: Kregel, 1999), 233. Stanley Toussaint, "The Contingency of the Coming Kingdom," in Integrity of Heart, Skillfulness of Hands (Grand Rapids: Baker, 1994), 225, 232-35.